Cronation is a site for imagining the world through Crone eyes and with a Crone’s heart. A Crone is compassionate and wise, practical and mystical, fearless and funny, truthful and playful. Full, in other words, of the living of a lifetime and willing to put everything on the line in service to the Divine Source. A Crone is also pissed off a great deal of the time because the world is a mess. It is time to pool our wisdom and our energy on behalf creating the world we wish to leave to our grandchildren. It is a time for calling our leaders to account and becoming witnesses to the world. Crone wisdom is about the clear-eyed celebration of what-is and the creative curiosity about what else can this be? Join the movement and let’s get this party started. What if a band of women tired of violence as a means of change went underground to dream, vision, paint and recreate the world as every mother and grandmother wishes it to be? 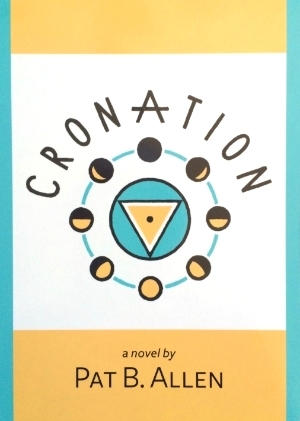 A celebration of imagination and creativity, Cronation is a send up of humans, both men and women, trying to do the right thing in what feels like the terminal swoon of civilization. When Eve, a mid-level corporate executive is swept out of her business life by Cronation operatives, the shift of eras throttles into high gear. Clad in bunny slippers and a crocheted blanket, Eve plays a key role in ushering out the patriarchal era. Meanwhile Yang, the mangy coyote-esque embodiment of all things male, is helped off stage by Harvey, the only regular guy in the underground Cronation movement. Working as agents of the Central Intelligence, Aurelia Astarte Marx and her band of loving but firm Crones know that everyone and every thing contains a spark of the Divine Source. Their mission is to support the birth pangs as this consciousness dawns on the planet while the Crones envision how everything from guns to government can be reimagined for the new era of sacred partnership and creative community. Will the Crones succeed in stabilizing this seminal clash of cultures? Can they neutralize a renegade from their own ranks who wants to fight violence with violence? Read Cronation and find out. Pat B. Allen is a writer, artist, wife, mother, grandmother and citizen dedicated to learning what it means to be a Crone in the world today. She has authored two previous books, Art is a way of knowing (1995) and Art is a spiritual path (2005) both published by Shambhala Publications. Cronation is a fictional reimagining of how Pat’s work to bring the Open Studio Process into being came into the world. Much of Pat’s previous work that has led her to this moment is housed at studiopardes.org.